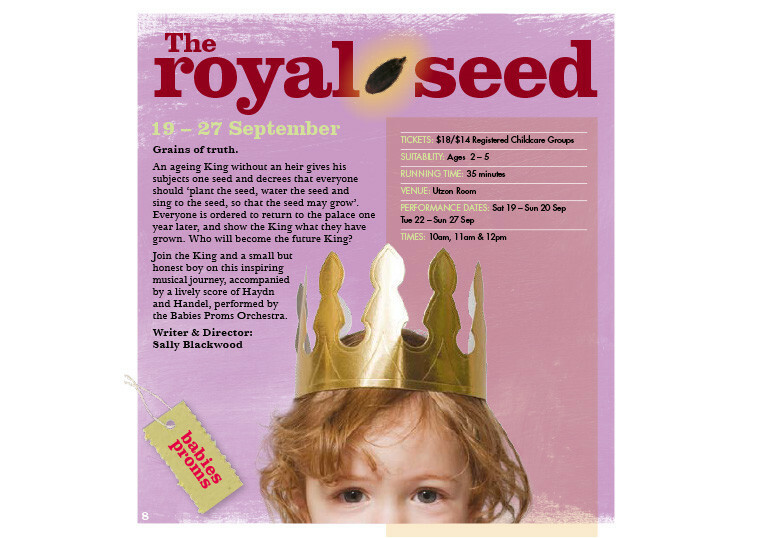 THE ROYAL SEED is fairytale for children. In the middle of the Kingdom, high upon the hill, sat the Golden Palace. In the Golden Palace lived Happy King whose only love was for the plants in his Enchanted Garden. As Happy King grew older, he knew that he needed to find an heir and so he devised a tricky plan to find his true successor. Happy King gave seeds to all the children of his kingdom and instructed the children to return in one year. The one who brought back the most beautiful plant was to be named as heir and the next Happy King! Our production, for children 3yrs+, brings to life an ancient folk tale of the journey of a Small Boy who through his honesty becomes the true King. This musical production is mixture of upbeat interactive nursery rhymes and songs for kids, interwoven with 18th century court music and jazz grooves. Originally commissioned by Sydney Opera House for Kids At The House Babies Proms series 2009.